This is an amazing new species of frog that was re-discovered in Borneo. Read more about it in the original article below. “Scientists in Borneo have discovered a new species of frog, and think that it may be one of the world’s smallest. 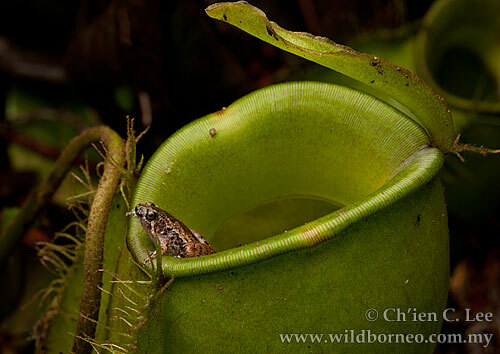 Although the frog, (the Matang Narrow-mouthed Frog) Microhyla nepenthicola, is no bigger than the size of pea when fully grown, it lives fearlessly inside and around carnivorous pitcher plants in Malaysian rain forests. “The tiny amphibian was officially introduced to the world on Wednesday, but researchers say that they have been hiding in plain view for more than a century. “I saw some specimens in museum collections that are over a hundred years old,” co-discoverer Indraneil Das said in a statement. Originally, many scientists thought that the frogs were simply juveniles of other species, but now realize they are actually adults of this newly discovered microspecies. 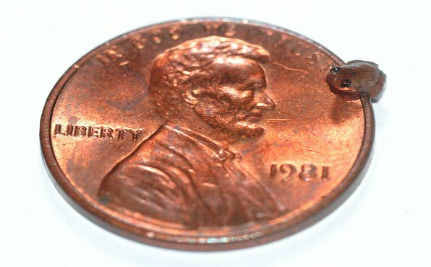 Despite its tiny size, the frog produces a loud, distinct croak, which is why scientists were finally able to locate it. “You often get tiny frogs making quite a noise,” said Robin Moore, a herpetologist who was not involved in the discovery told NationalGeographic. Moore is heading a Conservation International project to rediscover a hundred species of “lost” amphibians that have been declared extinct within the past decade. 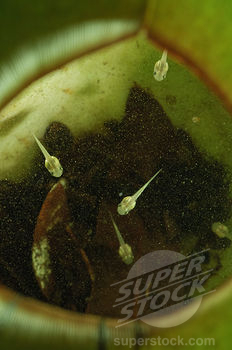 The tadpoles live in the pools of water and digestive enzymes inside the pitchers of Nepenthes ampullaria as seen in the below photos. 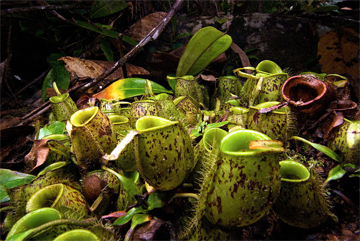 When we discover amazing species such as Microhyla nepenthicola that have developed incredible adaptations for survival such as living inside carnivorous plants we are astounded and marvel at its beauty and complexities. However, amphibians such as this tiny frog are vanishing all over the world due to pathogens such as the Chytrid fungus–a terrible frog plague that is responsible for wiping out entire species of frogs in the last few decades. Frog farming for frog legs and moving species around the planet for the pet trade have spread the Chytrid fungus and other pathogens around the globe. Toxins created and applied to our farms, gardens, yards, homes and bodies by us such as Triclosan (found in many household chemicals) and Atrazine (a common herbicide) are mutating and killing amphibians and other wildlife all over the world. A tiny creature such as this frog could vanish in an instant and we would never know. Now that we know of its existence it is up to us to preserve it and its habitat and to protect it from us. Please do all you can to help Save the Frogs. Some simple things you can do to help frogs is not eating frog legs, not using any products that contain Triclosan and working to ban the use of Triclosan and Atrazine from production and use all over the world. Also please consider making a donation to non profit conservation organizations such as Save the Frogs and Earthshine Nature who are working to spread awareness of the value of amphibians and nature conservation to all.